Our Grounds have been completely redone since Hurricane Irma and are more beautiful than ever before!! Our unit is CLEAN AND UPDATED!! We have a new kitchen and guest bathroom and WE TAKE PRIDE IN THE CLEANLINESS OF OUR UNIT!! Our tastefully decorated condo has immaculate tropical grounds and gardens! We are located on the first floor of a quiet building with private parking near the front door. New cabinets, granite countertops and tile backsplash in the kitchen, paint, furniture, mattresses and bedding, flooring and bathrooms are just some of the latest additions to our updated decor. You can watch high definition flat screen TV's in the living room and both bedrooms and bring your laptop and use our secured wireless internet. Swim in our heated pool, sunbathe in comfortable lounge chairs by the beach, read a book under one of our two tiki huts at the pool or play shuffleboard on our own court. You can watch the sunset at Sunset Park just one block away, walk down the path to our private beach to watch the sunrise or just relax under one of our many palm trees. Collect unique shells or snorkel in the Atlantic right off our white, sandy beach. Two gas grills are available to BBQ at our tiki hut on the beach while you keep an eye out for dolphins and manatees! Key Colony Beach has fine restaurants, a par 3 golf course, bocci, tennis and pickleball courts and a playground for children all within walking distance of our condo! Snorkeling, scuba diving and fishing boats are all available within a few minute’s drive. Grocery stores, shops and boutiques are nearby as well as fine restaurants and the captain’s catch-of-the-day is available at many local fisheries. Paradise is just a phone call or email away!! Bob and Sheli Burgess are from South Jersey and now live in Ocean City. This is our favorite place to come to relax and enjoy the sun, surf and serenity! We take immense pride in the cleanliness and upkeep of our unit and make it a priority to keep it comfortable and beautiful for our guests. Our condo was purchased by Sheli's parents in 1983. They loved that it was a tropical island to vacation to inside the US! No passports required!! Also, they loved the convenience of the first floor location! Sheli's mother now has a walker and it has been wonderful for her as she has been able to easily access the condo and maneuver around it with no problems. We love our beautiful decor and the comfortable feeling of our condo! 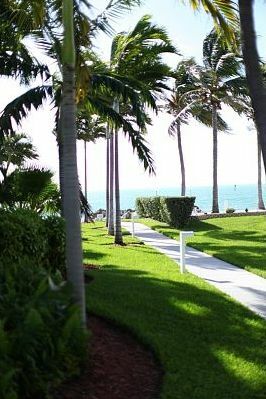 We never tire of the palm trees and gorgeous flowering bushes and plants surrounding us as well as being steps from the pool and turquoise ocean water. Located outside door of unit. Washer requires $1.50 in quarters. A total of $3.00 needed for a complete load to wash and dry. Located outside door of unit. Dryer requires $1.50 in quarters. A total of $3.00 needed for a complete load to wash and dry. 4 beach towels plus personal towels provided. 3 flatscreen TV's, one in each room and HD TV service provided. Two sets of snorkel gear in condo available for guests. We also have 4 beach chairs, an umbrella and floats available for use. Great condo! We had a wonderful vacation and this condo was perfect for our family. The beach was beautiful and the pool was relaxing. We were sad to leave and we will be back. Condo was very clean and exactly as described in the listing. Location was great, short walking distance to beach and pool, and convenient for restaurants and things to do. You will be so pleased to stay in this condo! It's clean, comfortable and has all you'll need for a lovely holiday. We've spent a week in this condo anually for several years now and we will be back again Thank you to Sheli for your kindness and generosity and for making us feel a part of your extended family. The condo was very clean and well kept, everything we could need in the kitchen for our cooking needs, great views, and all of the staff at sea aisles were so friendly! The private beach area is amazing. Close to many great restaurants, great activities for the whole family, and many areas to shop! Thank you so much to the owners for letting us stay in your unit. My family had such a amazing time. We will be back to book with you agian! We had a wonderful vacation, and really enjoyed staying in this condo. It was very clean, had everything we needed and was in a very convenient location! We enjoyed relaxing by the private beach and pool. Quick walk or drive to restaurants, par 3 golf course and to Sunset Park. Some of the highlights include spending the day at Sombrero Beach, fishing on the Marathon Lady, and spending a day in Key West. Would stay again if we come back to the Keys! This is our third time staying at Bob and Sheli's condo and it never disappoints. The condo is always spotless, as are the grounds surrounding it. Bob and Sheli are absolutely wonderful to rent from. I highly recommend staying here. Beleive me, you will never want to leave! !